Scent - Gingered Bergamot: A tantalizing fragrance that blends the fresh citrus bergamot with exotic spices such as ginger, sandalwood, patchouli, & basil. 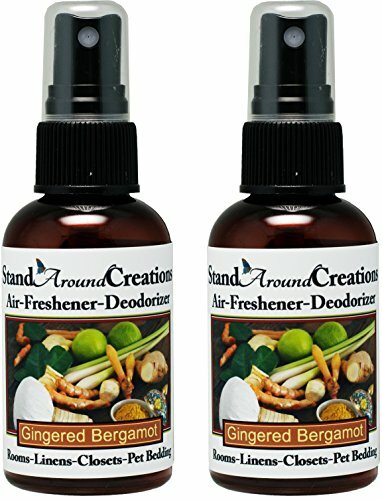 This air freshener / deodorizer spray does not contain toxic chemicals that typical air freshener products have which emit allergens and toxic air pollutants. This non-aerosol air freshener refreshes your car, linen and anywhere you want to mask odor. Made in the USA - Avoid spraying directly on finished wood surfaces, pets or skin. --- About Us: We have been selling candles and wax tarts in North Carolina for several years. We have done shows and local selling and have decided it is time to branch out. Handcrafting was once a proud standard in America that is now diminishing. We take great pride in our candle creations and hope they will provide you with much enjoyment. ----- Shipping: Items will be sent via USPS. Orders are filled Monday-Friday. Our offices are closed Saturday, Sunday and Holidays. Please allow 1 business day processing time. During warmer weather candles and tarts may soften. This is normal. Simply allow your item to cool before use. No international shipping at this time. We do ship to Alaska, Puerto Rico, and Hawaii. ----- Cautions: Keep out of reach of children and pets. Melted wax gets very hot and can cause burns, please use caution when handling hot wax. Allow candles, wax and wax warmer to cool before moving, covering or removing wax. This product contains oils that may cause damage to fabrics and other surfaces. Store in a cool dry place. Scent: Gingered Bergamot: A tantalizing fragrance that blends the fresh citrus bergamot with exotic spices such as ginger, sandalwood, patchouli, & basil.